In my post from last week about migrating from Googles Blogger to Hugo I mentioned that the hugo-minimalist-theme has been configured. This is not the case anymore, The site currently uses the Icarus theme, It has been modified a little to redirect site-wide searches to DuckDuckGo instead of Google. At one point I might figure out how to do that nicely and can send the change to the author of the theme. After moving from Blogger to a static site the next step to improve the website has been finished. Cloudflare offers protection, caching and statistics by routing web traffic through their servers. Setting this up has been pretty painless, and makes it easier to move from (now Oracles) dyndns.com services to other providers. 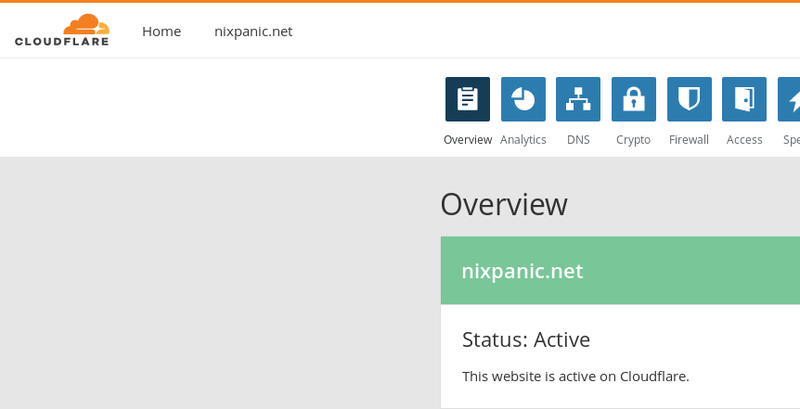 Currently the nixpanic.net domain name is still registered there, but I plan to cancel (or just not renew) the DNS service. Today I moved my Blog from Googles Blogger to a static site that gets generated with Hugo. These are the approximate steps that I have done: download the exorted XML from back up content import the posts into a new Jekyll site import the Jekyll converted MarkDown pages into a new Hugo site with hugo import jekyll run through the Hugo quickstart and verify posts It is possible that the theme I configured (hugo-minimalist-theme) does not work with tags that have UPPER-case letters in them, or are set to nil. The next Long-Term-Maintenance release for Gluster is around the corner. Once GlusterFS-3.12 is available, the oldest maintained version (3.8) will be retired and no maintenance updates are planned. With this last update to GlusterFS-3.8 a few more bugs have been fixed. Packages for this release will become available for the different distributions and their versions listed on the community packages page. Release notes for Gluster 3.8.15This is a bugfix release. The Release Notes for 3. The 10th of the month has passed again, that means a 3.8.x update can't be far out. 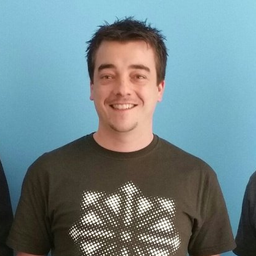 So, here it is, we're announcing the availability of glusterfs-3.8.14. Note that this is one of the last updates in the 3.8 Long-Term-Maintenance release stream. This schedule on the website shows what options you have for upgrading your environment. Remember that many distributions have packages included in their standard repositories, and other versions might be available from external locations. The Gluster releases follow a 3-month cycle and, with alternating Short-Term-Maintenance and Long-Term-Maintenance versions. GlusterFS 3.8 is currently the oldest Long-Term-Maintenance release, and will become End-Of-Life with the GlusterFS 3.12 version. If all goes according to plan, 3.12 will get released in August and is the last 3.x version before Gluster 4.0 hits the disks. There will be a few more releases in the GlusterFS 3.8 line, but users should start to plan an upgrade to a version that receives regular bugfix updates after August. Like every month, there is an update for the GlusterFS 3.8 stable version. A few more bugfixes have been included in this release. Packages are already available for many distributions, some distributions might still need to promote the update from their testing repository to release, so hold tight if there is no update for your favourite OS yet.Release notes for Gluster 3.8.12This is a bugfix release. The Release Notes for 3. An other month has passed, and more bugs have been squashed in the 3.8 release. Packages should be available or arrive soon at the usual repositories. The next 3.8 update is expected to be made available just after the 10th of May.Release notes for Gluster 3.8.11This is a bugfix release. The Release Notes for 3.8.0, 3.8.1, 3.8.2, 3.8.3, 3.8.4, 3.8.5, 3.8.6, 3.8.7, 3.8.8, 3.8.9 and 3.8.10 contain a listing of all the new features that were added and bugs fixed in the GlusterFS 3. The 10th update for GlusterFS 3.8 is available for users of the 3.8 Long-Term-Maintenance version. Packages for this minor update are in many of the repositories for different distributions already. It is recommended to update any 3.8 installation to this latest release.Release notes for Gluster 3.8.10This is a bugfix release. The Release Notes for 3.8.0, 3.8.1, 3.8.2, 3.8.3, 3.8.4, 3.8.5, 3.8.6, 3.8.7, 3.8.8 and 3.8.9 contain a listing of all the new features that were added and bugs fixed in the GlusterFS 3. We are proud to announce the General Availability of yet the next update to the Long-Term-Stable releases for GlusterFS 3.8. Packages are being prepared to hit the mirrors expected to hit the repositories of distributions and the Gluster download server over the next few days. Details on which versions are part of which distributions can be found on the Community Packages in the documentation. The release notes are part of the git repository, the downloadable tarball and are included in this post for easy access.